A classic, ornate and highly intricate pagan amulet of power and protection, fit for a high ranking Saxon or Viking leader/warlord. 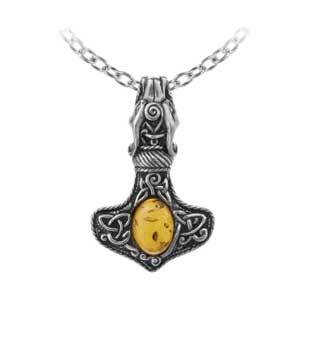 The head of a dragon bites the chain and the Celtic knot-worked hammer is set with a polished translucent, amber stone. 1 7/8" x 1 1/4" - 21" trace chain.